TOP　>　Products　>　Tuning Computer "T.E.C.II"
An intelligent system that revives the sporty feeling of the machine. The T.E.C.II system progresses simultaneously as Toyota continues to advance their vehicle computer technology. The T.E.C.II is capable of the fully processing the entire controls for an Toyota manufactured engine. Toyota computers processes a tremendous amount of data in at lightning fast speeds to keep the vehicle running at an optimal condition. At the slightest variation in the environmental conditions, the computer precisely changes the data to adopt to the change. Although it was very difficult, TOM'S is the only entity that has succeeded in controlling this system. The long generations of being involved in various motorsports as the technical leaders of a Toyota racing parts manufacturer has led to this superior knowledge. The T.E.C.II has been tested based on many hours of data logging in our in-house engine dynamometer bench, to input the most ideal data setting for each application. Not everything was based on pure numbers, also the physical factor of the sensation of the engine character was taken into account. 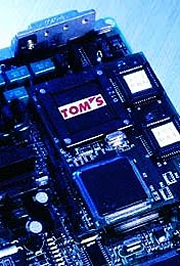 This is the reason why this product is referred to as the TOM'S Intelligence Computer. Engineering high quality engine parts is important, however if there is no means to precisely control these components via computer, the highest possible performance cannot be achieved. OEM ECU Part number submission required for Celsior models manufactured after July 1997. T.E.C.II applications differs depending on this pat number. OEM part number 89661-50450 requires 89600-TUF22-AT, OEM part number 89661-50522 requires 89600-TUF23-AT. Please reconfirm and inquire for any other part number. Boost pressure will increase with the installation of this product. Installation of air cleaners and mufflers may increase boost pressure as well. In this case, please install an aftermarket boost controller to regulate target boost pressures. * Boost pressures cannot be increased without the use of an aftermarket boost controller. Increased boost may result in intake piping dislodging from engine. Please inspect and replace (if necessary) clamps and hose securing material to prevent any damage. Only OEM air filters or TOM”S Super Ram II and OEM exhaust or TOM'S Barrel Systems recommended to be used with system. Installation and usage of any other aftermarket products will void any claims submitted for the product. *1: Product cannot be purchased without core exchange. Please uninstall OEM unit and ship to TOM'S and expect approximately 2 weeks for vehicle down time. *2: Product cannot be purchased without core exchange. Please uninstall OEM unit and ship to TOM'S and expect approximately 1 week for vehicle down time. *3: Product uses VSV valve as a set, enabling up to 1.0kg/cm2 of boost pressure increase. *4: Compliant with OEM Toyota computers with part number "89661-30C00", or Denso computers with "275100-5661", "275100-5662", and "275100-5663" part numbers. *5: Updates to standard computer not compliant if changed to "T.E.C.II d.m.t.". Please prepare a separate OEM computer if updates to original computer is required. In this case, it cannot be converted back to "T.E.C.II d.m.t." so please take caution. * Compliant only with OEM Toyota computers. Not compliant with Denso products. * Cannot be restored back to original configuration once "T.E.C.II" or "T.E.C.II d.m.t" has been installed. * May require AT relearning reset from a Toyota dealership.